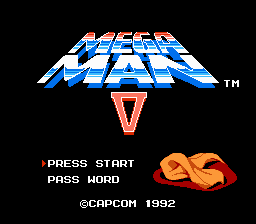 Mega Man 5 is a platforming game for the Nintendo Entertainment System. 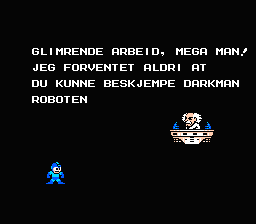 Dr. Light is kidnapped by Proto Man and its up to Mega Man to save him. 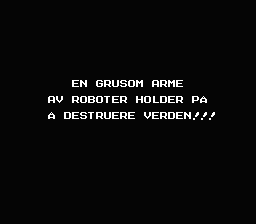 But first, Mega Man must defeat Proto Man’s army of Robot Master before reaching his stronghold. 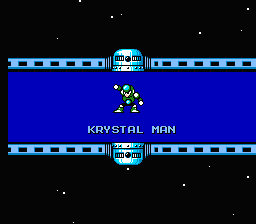 Unlike Mega Man 4, Mega Man 5 has the enhanced, wider Charged Shot. But the gameplay mechanics are the retained. Aside from having by his side his companion support robo dog Rush, a new robo bird named Beat joins him, created by Dr. Cossack. 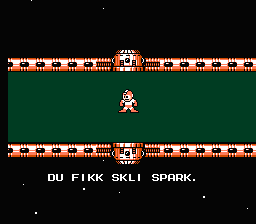 This is a Norwegian translation of Mega Man V for the NES. This patch is for the American ROM. All non compressed text was hacked.